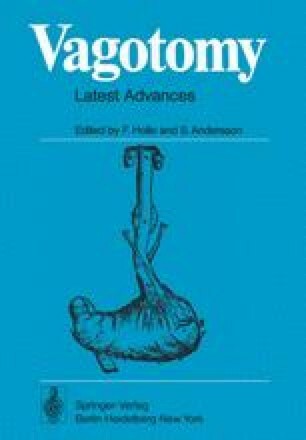 The vast majority of operations for duodenal ulcer that are performed in Western Europe and in America include vagotomy in an attempt to reduce the acid-secreting potential of the stomach. The pathogenesis of duodenal ulcer is not well understood but hypersecretion of gastric acid seems clearly to be involved. Since gastrin, the polypeptide hormone liberated from the antrum and proximal small bowel, is the most powerful known humoral physiologic stimulant of gastric secretion , it is logical to study the role of gastrin in the pathogenesis of duodenal ulcer and also to observe the effect of vagotomy on gastrin levels in patients with duodenal ulcer disease.